Some days ago, a friend asked me for suggestions of salads which are not so BORING AS TO BE INEDIBLE. It's possible he didn't speak in all-caps. Sometimes I exaggerate for effect. 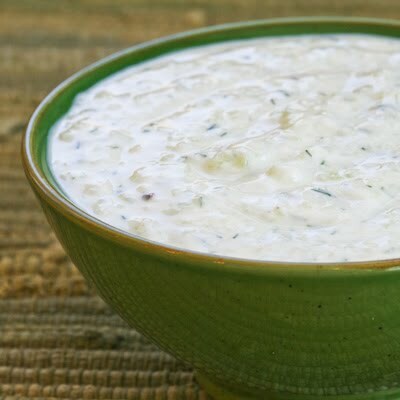 Among my thoughts of roasted red peppers, fresh olives, thinly sliced cucumber, arrays of fruit and walnuts, and what have you, it occurred to me that one of the greatest things you can do for a salad (or anything for that matter), is to dress it with tzatziki. Kalyn's Kitchen posted one of the better recipe's I've encountered. She called it the world's best. I have no idea if that's scientifically accurate. It tastes good, though, so go ahead and make it. Grab fresh dill if it's handy. Use greek yogurt (or, better, strain your own). If you have a salad or old shoe that needs eating, this will do you fine.